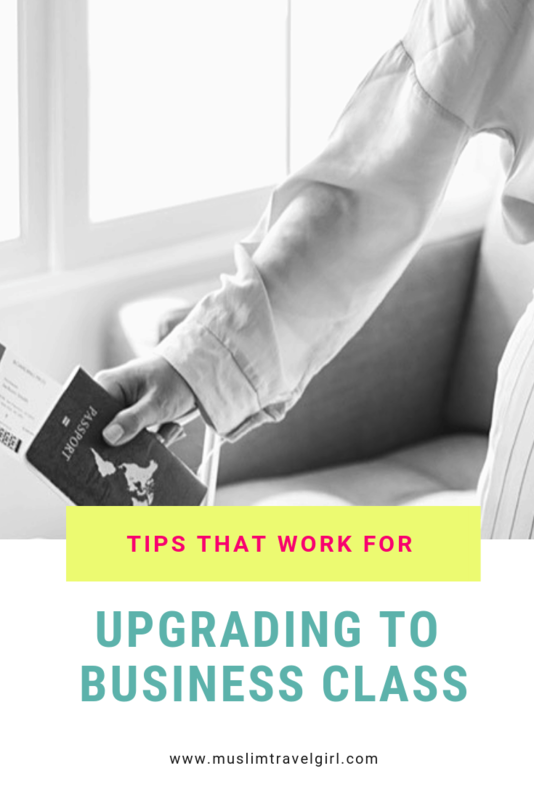 We have all seen posts on the best ways to upgrade from economy to business class and how some of that advice can be totally impossible to implement. Some others offer good advice but without much further explaining. So I thought I will break it down and remove some of the constant ‘dress nicely, smile, ask politely’ advice that circles the internet when it comes to upgrading to business class advice. In my 14 years of constant travel, I have dressed nicely 100 times, I have asked for upgrades 50 times, always with a smile and even offering to leave my husband in economy, all to no avail. And I have been upgraded to business by luck once in 2007! This was 10 years ago and since then nothing. I have known some fellow passengers when flying in business where upgraded by luck because the flight was full. This again is very rare and usually, upgrades are given to elites first and with the highest tier first. Funnily just before I get into travel hacking and the reason I started reading was so I can get at the front of the cabin and be upgraded for free! Then I learned there are better ways to be upgraded from economy to business that actually work although you do need to put effort or actually pay a small fee. If travelling at the front of the cabin is important to you, this is the best way. So let’s see what are the best ways to get you upgraded to the dream business class that actually work and I have used with 100% success. Many airlines today offer their business class seats for a small fee when checking in or a few days before the flight. Competition is fierce so they want to make the most they can by selling even discounted business class tickets. Many times the offer you will receive is actually cheaper than buying the ticket and paying cash for business class. Yes, you do have to pay but not many things come for free in the world. Unless of course, the angles of luck are on your side at the exact flight you want. Here is an example of a flight we actually did this with. My husband had to fly from Manchester to Doha, now I usually don’t buy a one-way ticket because it’s always more expensive but since we didn’t know the return date it would have been too much hassle. The best offer was on Oman air flight for £350 one way in economy I found. A couple of days before the flight we received an email offering the option to buy a business class upgrade for £500. We did take the opportunity and actually bought this option which resulted in a one-way ticket for £850 in business class for a 9 hr flight. The cash equivalent if we were to book directly in business class was £2,500 since I had already checked it and I knew the value. The upgrades will usually clear after a couple of days depending on the way they are set up. For Oman air, you had to put your bank details in and they took the money once confirmed. For other airlines such as Emirates and Etihad and others you will need to bid on the offer and put your maximum price, if accepted they will take the money and confirm your ticket a couple of days before your flight. One thing I noticed with Oman Air and also with British Airways is that they actually increase the prices initially offered. 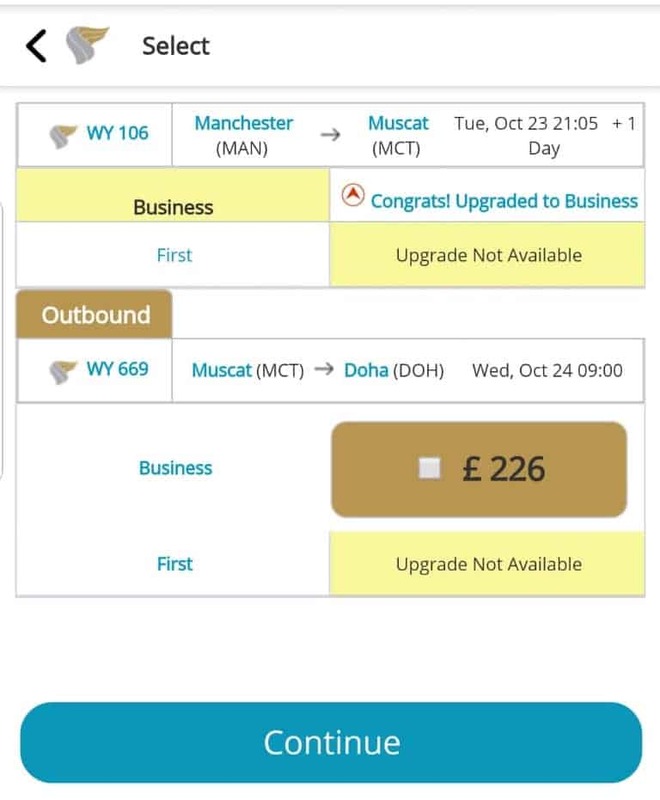 Oman air offered the second leg Muscat to Doha initially for £160 and then increased the price to £226. So in some cases, if you know you want to bid, bid on straight away so they don’t increase it. Good thing to also note is that usually there is an offer for each leg of your trip if you have a stopover. For us, we had two offers one for the first leg Manchester to Muscat and one for Muscat to Doha. The second leg is only 1hr and definitely not worth paying £160 or £226 for a recliner seat. So we didn’t upgrade that one. Tip: Always run a cost comparison and whether the price asked is worth for the duration of your flight. Sometimes it is not, especially on short legs where the seats are not a flatbed. Not many people know but you can actually request for the paid upgrade options at the airport while checking in. Many airlines, especially in America, will have a list with prices for upgrades that you can purchase on the spot when they have availability on the flight. Usually, you will not receive extra baggage or points for this but it will be a nice way to fly several hours on a discount. We have managed to fly 14 hours with an upgrade from economy to business class for a little over £500 for two people. I hated the outbound flight in economy so when the opportunity presented itself I went for it and bought the upgrade. I believe their flight was full so offering it on a cheap was better than giving upgrades away for free. I can’t say I was bothered because knowing I have a flatbed, ice cream and movies kept me going for the boring 14 hours. And being cramped in a full economy cabin is not very fun. If they don’t offer upgrades you can always ask for them while checking in, usually, they do have options and staff know the prices based on your ticket and the flight availability. For example, our flights from Doha to London regularly have offers of about £500 per person for an upgrade from premium economy to business class. This can be a good value for money especially if it is a night flight or you know the cash cost would have been more. Tip: Always have a maximum price you are happy to pay for an upgrade. For example, my default price for the routes I fly most is about £500 to £600 depending on the airline and the seat type. Know the maximum limit you can accept for an online upgrade or an airport upgrade. This way you can stay on budget. What usually helps me is knowing the cash value of the business class ticket as well beforehand. This tip works great for us and it is one I go back to very often. If you have been following my blog you know I love loyalty programs and I have a full guide explaining here. 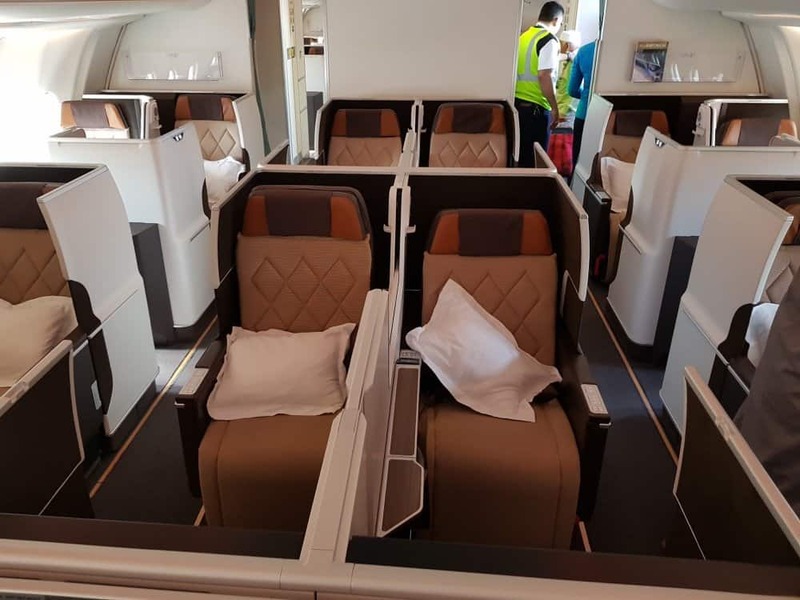 Currently, many airlines have started offering Premium Economy tickets which have very well priced and can easily be upgraded to business class. I prefer this method of upgrading to business class from economy because it means I spent fewer miles on the upgrade per person. 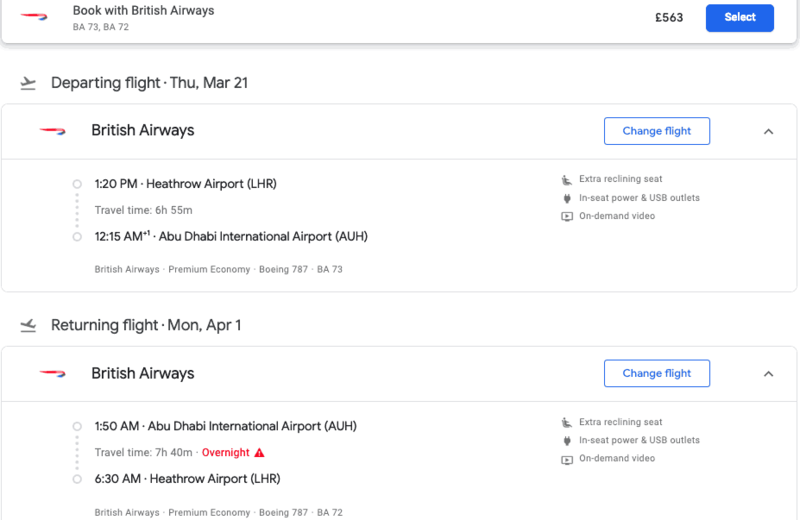 Premium Economy flight from London to Abu Dhabi with British Airways costs £550 while the economy ticket is about £400. The price difference is minimal and for the larger space, you get, definitely worth it to me. 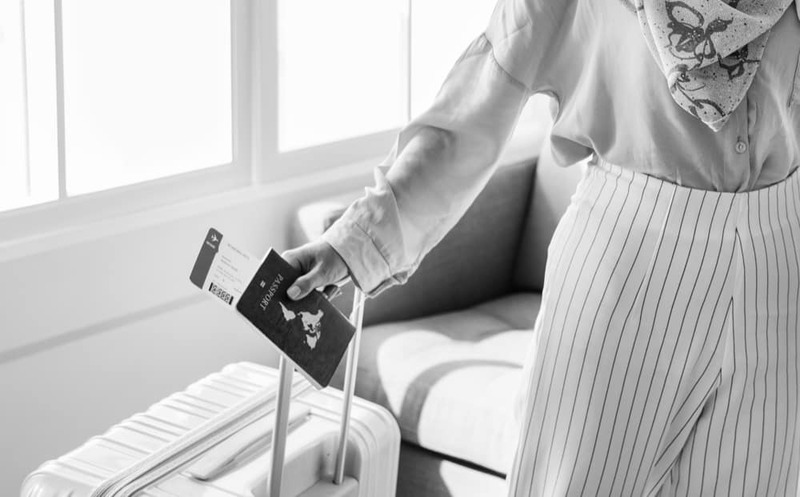 Now, if you have been collecting Avios (and you should) or if you have the Amex card that can be transferred to Avios you can use it and upgrade to business class upon availability. The upgrade from Premium Economy to Business class on British Airways is one of the best uses of Avios because it costs 26,000 Avios plus £100 extra in taxes. Considering that you can receive 22,000 (when referred from Amex so if you want to let me know) and hitting the spending you will be upgrading a one-way flight. This is something I love doing and the miles you receive from your Premium Economy flights will almost cover ⅓ of the cost of your upgrade depending on your status. Currently, I have a flight that is not yet available for upgrade, but when booking premium economy you will see this option on the right in your “manage my booking page”. The options will be on the left and closer to the flight time you will see the actual price they offer for cash upgrade. 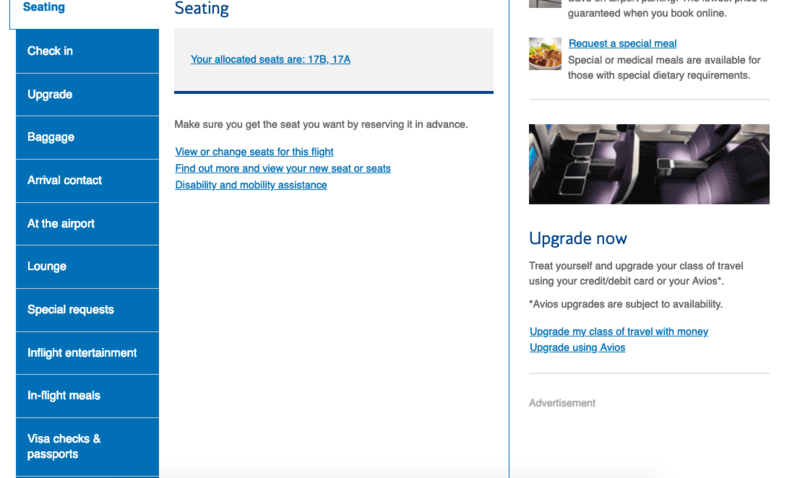 British Airways usually opens availability for an upgrade (if not available at the time of booking) about a month in advance if business class seats are available. As I said I love being smart with my spending and making my money and points work harder for me. No matter on your destination however you can always check out some of the advice from Wego Middle East in their new Arabic blog for Middle Eastern travellers. They offer some slightly cheaper flights when travelling outbound from the Gulf. Tip: Upgrade the flight that is the longest. For example, my flight from Doha to London is 6,5 hours but from London to Doha it is 7,5 hours and during the night time. So obviously my preference is always to upgrade the flight that is longer and a red eye. Nothing beats a bed in the sky to sleep during the night! Tip 2: You can log into the British Airways account and search for an upgrade with Avios on a cash flight to find availability for upgrades either from Economy to Premium Economy or Premium Economy to Business (best value). Even if you don’t have the Avios to book currently you can see the prices and dates available. 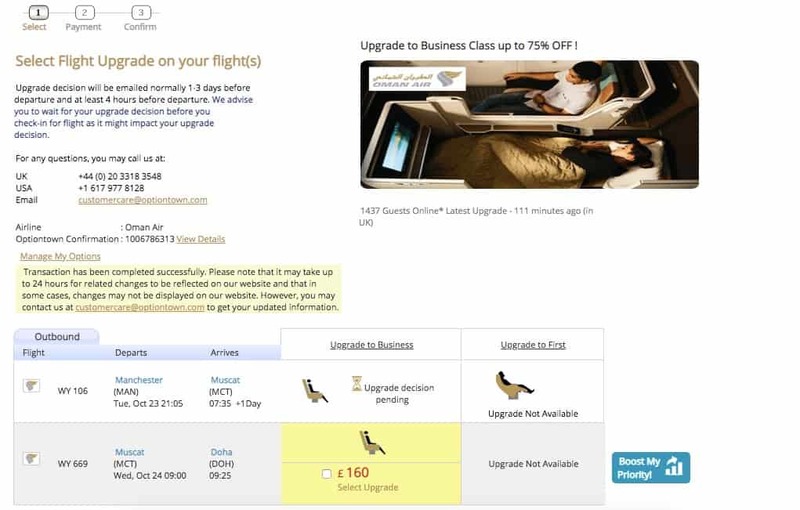 Please note you can only upgrade one category up, so you can’t jump from Economy to Business (unless bidding or accepting an online offer) or from Premium Economy to First class. This is for those of course who have accumulated some miles and thinking about what to do with them. You can, of course, use them for booking a flight in business direct. This will require you to have a large number of points whether from sign up bonuses on cards or from flying around the world often. A strategy like this works great for people who travel often on business but spend their miles on pleasure trips with the family. I have friends from the blogging sphere or from business who have millions of miles and have no issue upgrading and spending 120,000 Avios on a flight per person. Personally, I find this harder to accumulate this amount of miles for the average Joe or for families. For us, we are two people which would mean we need 240,000 Avios if we had a child this would mean extra points required. Our travel strategy doesn’t make much room for accumulating this many miles for spending on a business class ticket. I rather buy a Premium Economy flight as mentioned above and spend 26,000 Avios on a one-way upgrade. This way I find I get the best value for my money while also earning some of the points back. 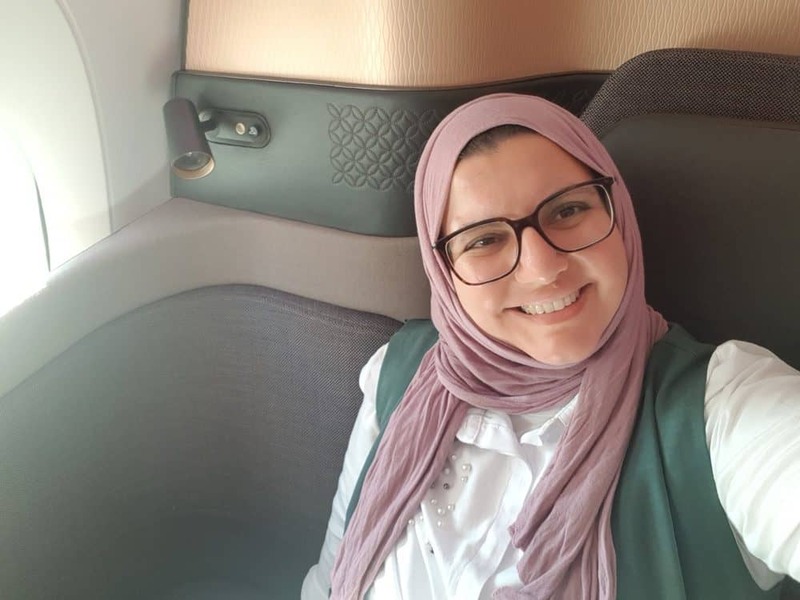 I have redeemed flights for business class and my favourite is the sweet spots of airlines like the Oman air redemption I did from Jeddah to Muscat while on Umrah. We spend 12,000 for a 3-hour flight in business class which was a great value compared to the cash equivalent. I also love to have flexibility with my points, It is also one of the reasons why I prefer having the American Express card than a card that only earns me specific miles such as Avios. Of course, it is each to their own and I know many people would rather redeem directly because they have millions and it’s great because this definitely gets you a business class seat. I have done this on a recent trip to check out the new Qatar QSuites available but this will be a rarity and done just for one person rather than the whole family. These for me are the best tips and most accurate ways that actually work to upgrade from Economy to business class. Yes, randomly you can be lucky to get upgraded on a full flight but this is such a low percentage that it is much more tiring. Also, it works best for single people than families or couples. If you want to fly at the front of the cabin you do have to spend some money and strategise a little bit but it is worth it. I love the fact that I can decide when I want to fly in business class because I have planned it in advance. I will be doing a post on my travel strategy very soon. What are some of the tips that have worked for you in order to fly in business class without paying cash? I’m gonna try this next time I fly. Flying for 850 instead of 2500 is a great deal.